If you’re anything like me going away on a short break by plane and only being able to take a cabin bag can be quite a challenge as to what grooming products I can take! After all, you’re only allowed one tiny clear bag for all products! Men-Ü have obviously thought about this when they developed their travel kit. You’ll probably know the maximum size individual liquids you can carry on planes is a 100ml. 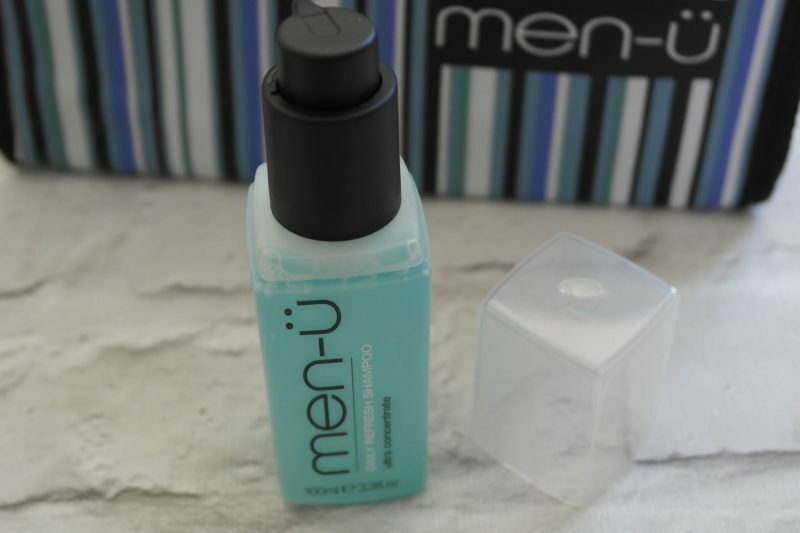 With the Men-Ü travel kit you don’t have to worry about dispensing your shower gel and shampoo into little travel bottles again… they’ve created a travel set with a mix of 100ml products and even smaller size trial or buddy size products. The products come in an eye catching stripey wash bag which I’m sure most guys would be happy to have in their travel bag! The range of Men products is quite unique, they offer a range of high quality, ultra concentrated men’s grooming products at fairly reasonable prices. This zesty and super fresh concentrated shower gel will help to invigorate you. It’s quite unique as mint and lemon isn’t a fragrance combination I’ve come across before. It’s up to 4 times more concentrated than your regular shower gels so obviously means you don’t need to use as much. Although, I found it’s a bit like using concentrated cordial… you still end up using a similar amount as none concentrated type! This 100ml version is supposedly good for 80 showers… it just depends how restrained you can be at using small amounts! This is where the term ultra concentrate really impresses! I’ve tried various shampoos that have a concentrated formula, but this is a cut above the rest. For short hair like mine, even a pea sized amount is too much! This bottle is supposedly good for 120 washes, although I’ve not been able to test this, I can believe it’s possible! The shampoo creates a good thick foamy lather, cleanses well and leaves your hair feeling super soft and fresh. The pump action bottle is great for controlling the amount of product per use, helping you to make it go further! Although they are mini in size (15ml), these products are also concentrated, so if you use sparingly they potentially could go a long way! I’m not one for wet shaving as it irritates my skin too much but if this is your thing, the shave cream has you covered, it contains tea tree oil that’s good natural antispetic. It’s even good for 20 shaves! The skin refresh gel, an anti-shine and fragrance free toner gel, which can be used on normal, combination or oily skin! Helps to control excess oil buildup that can cause blocked pores and breakouts and even can help tone and tighten skin. It’s recommended to use it after shaving to help cool and soothe skin, but can be used after washing also. The liquiflex is a medium hold and medium shine hair product. Although, for me, I did find it was more light than medium hold factor. The product goes from cream to liquid in your hands/fingertips to help even distribution through your hair. I personally prefer a hair product that has a slightly higher hold factor like the clay that’s available in the hair care range. The Travel Kit is available to buy from Men-Ü priced £29.95 which is a saving over £11 if you were to purchase the products individually. 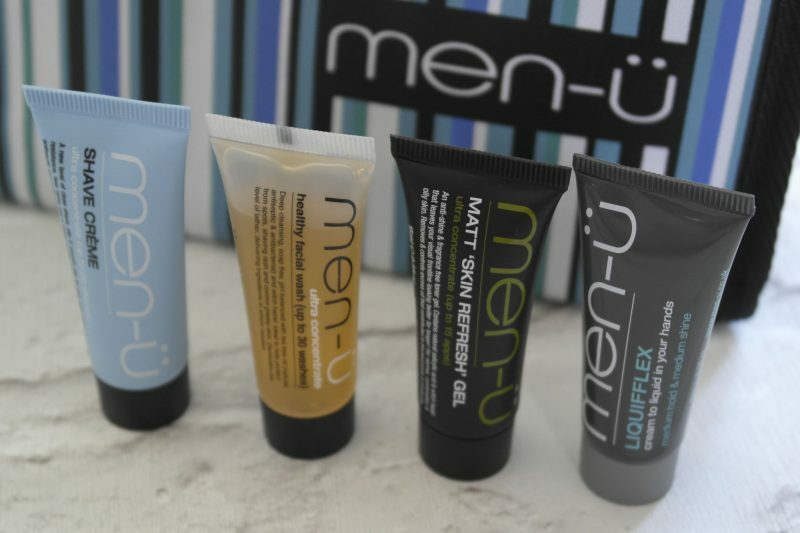 Have you tried any of the Men-Ü product range? What were your thoughts? Let me know using the comments box below.